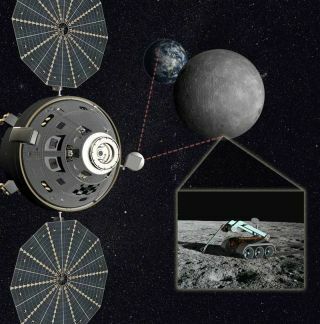 Sending astronauts to a deep-space outpost beyond the moon's far side could help lay the groundwork for more ambitious manned missions to Mars, some researchers say. Such a lunar effort would take humanity farther from Earth than it's ever been before, allowing scientists and engineers to work their way up to even more distant targets such as asteroids and Mars in a stepwise fashion, advocates say. "It's a really good way to basically dip your toes in deep space," Josh Hopkins, a space exploration architect for Lockheed Martin Space Systems in Denver, said during a Nov. 14 presentation with NASA's Future In-Space Operations working group. Astronauts would ride to EML-2 aboard NASA's Orion capsule, which is being built by Lockheed Martin. Orion would get off the ground atop the Space Launch System(SLS), the agency's huge new deep-space rocket. The launcher's first unmanned test flight is slated for 2017, and NASA hopes the SLS-Orion combo will begin carrying crews by 2021. EML-2 is an interesting target in its own right, Hopkins said. From there, astronauts could teleoperate rovers on the far side with relative ease, helping explore a part of the moon that remains little-studied to date. Such rovers could gather samples for a possible return to Earth, he said, which could shed light on the moon's mysterious impact history. The robots could also deploy huge antennas, helping set up a powerful instrument that would take advantage of the radio "quiet zone" found on the lunar far side to investigate some of the universe's deepest mysteries. "You can do, particularly, low-frequency radio astronomy from the far side that you can't do from Earth," Hopkins said. But the main reason to set up a manned outpost at EML-2, Hopkins said, is to lay the foundation for human missions to even more far-flung destinations. In 2010, President Barack Obama directed NASA to work toward getting astronauts to a near-Earth asteroid by 2025, then on to the vicinity of Mars by the mid-2030s. EML-2 would be a good stepping stone along the way, Hopkins said. Missions to EML-2 would teach NASA and its partners how to operate without a resupply safety net, for example, and would help work out any kinks that may exist in the SLS-Orion pair. "If things go badly enough, you can always get home pretty quickly," Hopkins said. "That's basically not possible for an asteroid mission, or a Mars mission." A space station at EML-2 would also serve as a teleoperations training ground, he added, paving the way for efforts to drive Mars rovers from one of the Red Planet's two tiny moons, Phobos and Deimos. While the path Hopkins discussed was drawn up by Lockheed Martin, it appears NASA may be thinking along similar lines. Agency officials have said recently that they are indeed planning to send astronauts back to the moon's neighborhood. "Let me say that again: We're going back to the moon, attempting a first-ever mission to send humans to an asteroid and actively developing a plan to take Americans to Mars," she added.